Wash Asian mix and divide onto plates. Roughly chop seafood salad and place into large bowl. Slice cucumber on angle and cut slices in half. Seed and chop capsicum. In a mug or small container mix together yogurt and mustard until well combined. 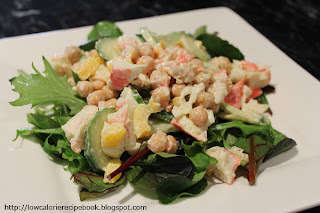 Place seafood, chickpeas, capsicum and cucumber in a bowl and stir through dressing. Divided mixture onto Asian lettuce and add a squeeze of lemon juice to serve. I recommend you don’t skip the last step. The lemon juice is important for the taste of this dish.